Here’s a side project that got out of hand. 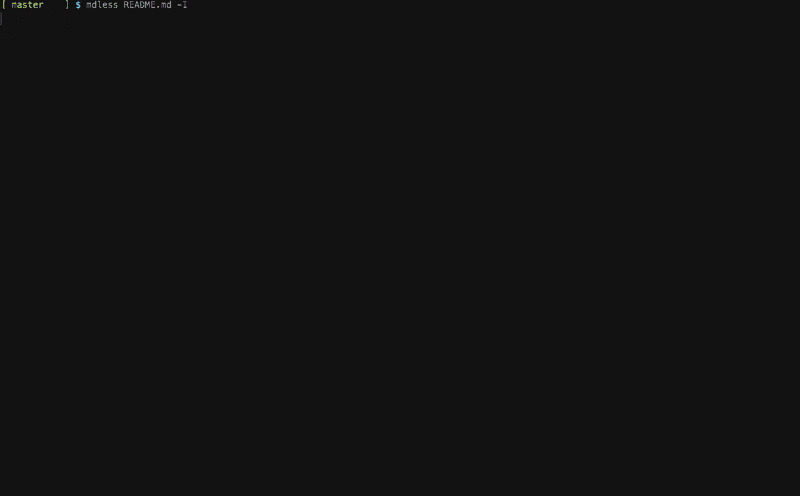 I wanted to be able to view Markdown README files quickly and pleasantly from Terminal. More often than not, I’m working in an iTerm2 visor window, so opening any app—including a simple qlmanage -p—will make my current view slide away. Not a big deal, of course, but it seemed like it could be easier. I created mdless for this. It’s a little utility that colorizes, cleans up, and pages Markdown documents. You can use -s SECTION to spit out just a single section of the document (use --list to show available sections). Markdown is pretty easy to read just as a text file, but some README files are really long and have a lot of cruft that only looks good when rendered. So this tool cleans it up. It also fixes table formatting and highlights it, among other goodies. If you have Pygments installed, fenced code blocks will be highlighted. And if you’re running the latest iTerm2 (beta), you can even view images inline. You can install it with gem install mdless (you may need to use sudo gem install mdless depending on your setup). It’s been tested on systems with Ruby 1.9 through 2.1. It should work on non-Mac systems, but I haven’t tried it out. mdless is a work in progress, but it’s doing everything it was supposed to do already. Check the project page for more info.